Blog / Articles / Tax Cuts and Jobs Act of 2017. What You Need to Know. The President signed the Tax Cuts and Jobs Act of 2017 on Friday, December 22, 2017. Below are comments on some of the key aspects of the new legislation. Please note: to date no new regulations interpreting these statutes have been issued; such regulations could affect the information contained in this newsletter. Most individual tax reform is temporary. Unless noted, the provisions discussed below will go into effect on January 1, 2018, and expire on December 31, 2025. The new legislation increases the standard deduction beginning in 2018 to $24,000 for joint filers, $18,000 for head-of-household filers, and $12,000 for all other individual filers. The deduction will be indexed for inflation in future years. The additional standard deduction for the elderly and the blind is retained. The new legislation suspends the deduction for personal exemptions through 2025. The Child Tax Credit will be increased to $2,000 per qualifying child, with up to $1,400 being fully refundable. A qualifying child is a dependent child who is under age 17. The credit begins to phase out for joint filers with adjusted gross income exceeding $400,000 and other filers with adjusted gross income exceeding $200,000. A $500 non-refundable credit may be available for other dependents who do not meet the definition of qualifying child. The new legislation suspends through 2025, the deduction for moving expenses except in the case of a member of the U.S. military who moves pursuant to a military order. For any divorce or separation agreements entered into after December 31, 2018, the deduction for alimony or separate maintenance payments is repealed. Recipients of alimony or separate maintenance payments will no longer be required to include the alimony payments in their gross income. Under the new provisions, alimony or separate maintenance payments will be treated similar to child support, in that they are not accounted for in the tax system (no deduction and no inclusion). Existing alimony and separate maintenance agreements are grandfathered in as are any modifications to existing agreements. However, the parties to a modification may expressly provide that the new rules should apply to the modified agreement. The AMT for individuals is still with us despite some effort to repeal it. The exemption amounts have been temporarily increased to $109,400 for joint filers and $70,300 for single filers (from the current exemptions of $83,800 and $53,900 for joint and single filers, respectively). The exemption phase-out thresholds will also be increased to $1,000,000 for joint filers and $500,000 for single filers. The estate, generation-skipping tax, and gift tax exemption amount would be doubled to $10 million per person (indexed for inflation) through 2025. The new legislation does not incorporate a House proposal to repeal the gift and estate tax. Basis adjustments of assets at death are retained. The tax rates for capital gains and dividends will be left unchanged. Also left unchanged is the net investment income tax (the 3.8% surtax). 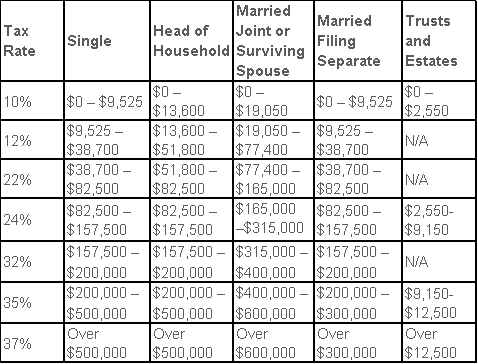 The mortgage interest deduction will be limited to interest on $750,000 ($375,000 for married filing separate taxpayers) of acquisition indebtedness on a taxpayer’s primary and secondary residences. The interest deduction for home equity indebtedness is suspended. State and local income or sales and property tax deductions will be limited to $10,000 ($5,000 for married taxpayers filing a separate return) for the aggregate of nonbusiness (1) state and local property taxes, and (2) state and local income taxes or sales taxes. It does not appear that the $10,000 limitation is indexed for inflation. Please note, prepayments of state and local income tax for 2018 made in 2017 are treated as paid as of the last day of 2018. Unreimbursed medical and dental expenses will be deductible subject to the extent they exceed 7.5 percent of adjusted gross income (AGI) in 2017 and 2018. The percentage increases to 10 percent (the threshold in effect under current law) in 2019. The allowed deduction applies to both the regular and alternative minimum tax. The new legislation eliminates some miscellaneous itemized deductions which include brokerage advisor fees, tax preparation fees, trustee fees, and other costs incurred in the production of income. Personal casualty losses will be limited to only those losses incurred in federally declared disaster areas. Charitable contributions now have a modified AGI limit for gifts of cash to public charities and certain other organizations which is increased from 50 percent to 60 percent. However, a charitable deduction is now denied for payments made in exchange for college athletic event seating rights. Pease limitations on itemized deductions are repealed. Graduate students: tuition waivers provided to graduate students will remain nontaxable. Teachers’ expenses: the deduction for out-of-pocket classroom expenses paid by certain educators will remain in place. Section 529 plans: up to $10,000 per year of distributions from 529 plans can be used for elementary and secondary school, in addition to expenses for college, but not for home-schooling. Education credits: proposals to combine the American Opportunity and Lifetime Learning Credits into one benefit were not adopted, so the current incentives stay in place. Student loan interest expense: proposals were made to eliminate this deduction but not adopted. Specific identification: the Senate proposal to eliminate the ability of investors to specify which lots of stock they choose to sell or otherwise dispose was removed from the Bill, so current law still applies; stock basis planning is still available for sales, gifts, transfers and charitable contributions. The corporate tax rate becomes a flat 21%. The new rate applies in 2018, not 2019 as originally proposed. There is no specific tax rate for Personal Service Corporations. The Corporate Alternative Minimum Tax is repealed. S-Corporations, Partnerships (including LLCs taxed as partnerships), sole-proprietorships and trusts are all eligible for a newly created 20% deduction for qualified business income. This rule is subject to various exclusions, limitations and other qualifications. Geffen Mesher will issue additional guidance on the 20% deduction, but the general rule is a 20% deduction is allowed for US qualifying income, to be applied at the partner or S-Corporation shareholder level. This is an area where additional planning has a strong potential to result in more efficient business structures. Under the new bill businesses can expense 100% of certain business property placed in service after September 27, 2017 through bonus depreciation. After 2022, this expensing option is reduced by 20% annually. This provision covers a wide range of business assets and expands the eligibility to used assets. The section 179 expense limit will be increased from $500,000 to $1 million. Additionally, there is an expanded definition of real property eligible for the election. The deduction for domestic manufacturing under Section 199 will be repealed. The new legislation contains numerous additional timing and expensing changes relating to depreciation periods, UNICAP, farming, and other items. Net Operating Losses (NOLS) may only be carried forward; there will be no possibility to carry them back to prior years. Additionally, they will only be able to offset 80% of income in years they are carried to. The deductibility of net business interest expense will be limited to 30% of adjusted taxable income; exceptions apply. Notably, businesses with gross receipts of $15 million or less would be exempt from this limitation. Section 1031 tax-free Like-kind Exchanges will be limited to exchanges of real property. The R&D credit is preserved. Under current law, taxpayers may elect to expense research and software development costs, or capitalize these costs and amortize them over five years; beginning in 2022 these costs will need to be capitalized and amortized over five years. Meals and entertainment deductions are disallowed under the new legislation with respect to any activity generally considered to be entertainment, amusement or recreation; membership dues with respect to any club organized for business, pleasure, recreation or other social purposes; and the costs associated with an on-site facility used in connection with any of the above items. Taxpayers may still generally deduct 50 percent of the food and beverage expenses associated with operating their trade or business (e.g., meals consumed by employees on work travel). Significant changes were made to the taxation of international businesses, including a deemed repatriation of post 1986 accumulated foreign earnings. New sourcing rules were implemented which change where activities are considered taxed. Additionally, certain “minimum” taxes apply to entities which pay significant amounts to offshore related parties and new compliance reporting is required for these structures. The rules are exceptionally complex and will need additional and future guidance in many areas. Financial statements will require analyses and adjustment to deferred tax items. If a company has an overall net deferred asset, they will— generally—require a charge against earnings or equity as the net deferred asset is revalued using a lower future effective corporate tax rate; the future tax benefits will be realized at a lower rate than is recognized on the current balance sheet. The opposite is true for a company with overall net deferred tax liabilities: generally, it will have a pick-up in earnings or equity as the future reversing temporary differences are taxed at a lower corporate tax rate; hence, a lower future tax liability when compared with today’s balance sheet. In addition, companies with accumulated foreign earnings will have to assess the income tax accounting resulting from those earnings no longer being able to be considered “permanently reinvested” overseas. And, the financial statement adjustment for potentially disallowed or suspended tax effects for interest expense, executive compensation, NOLs and foreign operations will have to be reviewed. Pre-pay state and local income taxes and real estate taxes as you will be limited to a total of $10,000 in 2018. Make year-end charitable contributions if you are inclined to do so, especially if you expect the higher standard deduction to prevent you from itemizing deductions in future years. If you have a home equity line of credit and expect to still itemize deductions for 2017 you should consider paying down your home equity line of credit, since the deduction on interest paid on home equity debt will be suspended. Carry back net operating losses because beginning in 2018, the new legislation prohibits net operating loss carrybacks, and future generated net operating loss carryovers can only offset up to 80% of taxable income. If your business might incur a tax loss for 2017, consider accelerating deductions to maximize the 2017 net operating loss. The new provisions only apply to net operating losses incurred after December 31, 2017, so a 2017 loss can still be carried back two years and can potentially offset 100% of future years’ taxable income, if carried forward. Purchase business assets in 2017 and take advantage of the new 100% bonus depreciation; this bonus depreciation is now available for any assets placed in service after September 27, 2017. Consult with your financial adviser to see if you have unrealized losses to recognize in 2017. Consider accelerating deductions into 2017 and deferring earnings into 2018 as tax rates are expected to decrease under the new law. The new legislation represents a major change in several areas of taxation. Geffen Mesher is ready to assist you in complying with the new rules and to ensure your activities, transactions, and businesses are structured in a tax efficient manner. We anticipate the issuance of new regulations in 2018 and the possibility of additional legislation to address oversights, errors, and unintended consequences in the newly passed law. Please do not hesitate to reach out to us with any question you have on the new legislation’s effect on you or your business.